Chemical giants Bayer and Syngenta commissioned private studies which showed that their neonicotinoid pesticides can cause serious harm to bees, a Greenpeace investigation has uncovered. The revelations come with the UK set to decide its own policy on pesticide use once it leaves the EU. The UK lobbied against the current EU ban when it was introduced. The company research – designed with regulators to reveal the level at which their products harm bees – was obtained through freedom of information (FOI) requests to the US environmental regulator. Publicly the two firms have often sought to play down suggestions that their products can cause harm to honey bees. However, the studies will cause little surprise in industry circles. 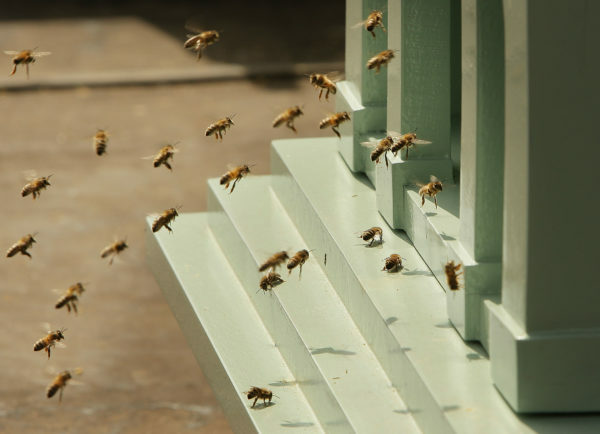 Industry and scientists have long known that the products can harm bees at certain levels. Instead the research has been criticised by experts because it assumes a very narrow definition of harm to bee health and ignores wild bees which evidence suggests are more likely to be harmed by neonicotinoids. It means the studies may substantially underestimate the impact of the two firm’s products on pollinators. Due to commercial confidentiality rules, Unearthed is not allowed to release the studies in full. The latest revelations have sparked calls for greater transparency from the industry and regulators to publish data on the impact of pesticides on pollinators used to make – or lobby for – regulatory decisions. Responding to Greenpeace, Syngenta said it’s study was due to be published in a journal – though the company did not give details. Bayer said the study would be discussed at an upcoming conference. Both firms claimed that whilst the studies did show a risk to honeybees from their products this would only apply at higher concentrations than normally seen in agriculture. Each study focused exclusively on honeybees, though recent research has shown that the chemicals have a negative impact on wild bees. “Sections 3 and 4 of the Federal Insecticide, Fungicide and Rodenticide Act (FIFRA), the primary federal law governing the regulation of pesticides, make clear that EPA must require the submission of studies from pesticide applicants and registrants to support registration, registration review, and re-registration decisions. The newly uncovered studies examined the impact of Bayer’s clothianidin and Syngenta’s thiamethoxam on honey bees at varying concentrations. Both show that chemicals can seriously harm honey bee colonies at high concentrations, though the effects were less marked at lower levels, concentrations of 50 parts per billion (ppb) and 40ppb respectively. In the US, the EPA is currently conducting a review of neonicotinoid pesticides and their impact on pollinator health. Back in January the first stage of this review found that imidacloprid, which is made by Bayer, harmed honey bees and suggested it “could potentially take action” to “restrict or limit the use” of the chemical by the end of 2016. The findings of the reviews into thiamethoxam and clothianidin, from which these two studies are taken, are due to be published in 2017. The unpublished research comes after previous assurances by Syngenta in particular about the impact of its product on pollinators. On its website, Syngenta, states there is “no direct correlation between neonicotinoids use and poor bee health’ and ‘the allegation that neonicotinoids-based pesticides are inherently damaging to bee colonies or populations is not true”. “None of the studies Syngenta has undertaken or commissioned for use by regulatory agencies have shown that thiamethoxam damages the health of bee colonies and we stand by the integrity of our neonicotinoid product. The private research did not examine the impact of the product on bee colonies in “normal” conditions. Other studies have done so however. Last month, a study by the Centre for Ecology and Hydrology linked the long-term decline of wild bees in England to the use of neonicotinoids. A major field study in Sweden last year found that wild bees were badly affected when exposed to fields treated with clothianidin, while honey bees proved more robust. Q1: Request for advice on Affirmation of Non-Multinational Status regarding two studies. EPA cannot provide advice with respect to compliance with the Affirmation of Non-Multinational Status. The agency’s clothianidin and thiamethoxam risk assessments are still under development, so we cannot comment on them or studies that may or may not inform the assessments. Q2: When will the EPA make a decision in its review of Thiamethoxam and Clothianidin? EPA plans to complete its risk assessments for thiamethoxam and clothianidin in 2017 and will make a decision after considering public comment. Q3: Will these studies feature in any decision the EPA makes on this issue? The EPA has not yet completed its environmental risk assessments for thiamethoxam and clothianidin, and we cannot say until we make our final regulatory decisions. Q4: Did the EPA provide any guidance to Bayer and Syngenta before they submitted these studies? The EPA has posted to the Web guidance on pollinator exposure and effects data that registrants must submit in support of our ongoing registration review process for these chemicals. We also provide direct guidance to registrants on the specific data they must generate and submit for particular chemicals. Sections 3 and 4 of the Federal Insecticide, Fungicide and Rodenticide Act (FIFRA), the primary federal law governing the regulation of pesticides, make clear that EPA must require the submission of studies from pesticide applicants and registrants to support registration, registration review, and re-registration decisions. Congress placed this obligation on the pesticide registrant rather than requiring taxpayers to fund such data. In a statement to Unearthed, a Bayer spokesperson said: “The study conducted in North Carolina is an artificial feeding study that intentionally exaggerates the exposure potential because it is designed to calculate a “no-effect” concentration for clothianidin. Although the colony was artificially provided with a spiked sugar solution, the bees were allowed to forage freely in the environment, so there is less stress (which can be a contributing variable) than if they were completely confined to cages. Responding to our story, a Syngenta spokesperson said: “The EPA asked us to do this study and agreed the methodology. A sucrose based mechanism was used on the basis that it was required to expose bees artificially to Thiamethoxam to determine what actual level of residue would exert a toxic effect.